As the need for skilled trade workers continues to grow, we’ve seen schools and industry partners increase efforts to shine a spotlight on the many opportunities that exist for students in fields such as manufacturing, automotive, agriculture and more. In November, the spotlight shined brightly on two Sutherlin teachers who have grown particularly strong career and educational programs at their school. The teachers won second-place in the 2018 Harbor Freight Tools for Schools Prize for Teaching Excellence, earning them and their high school skilled trades program $50,000 as part of $1 million awarded nationally. 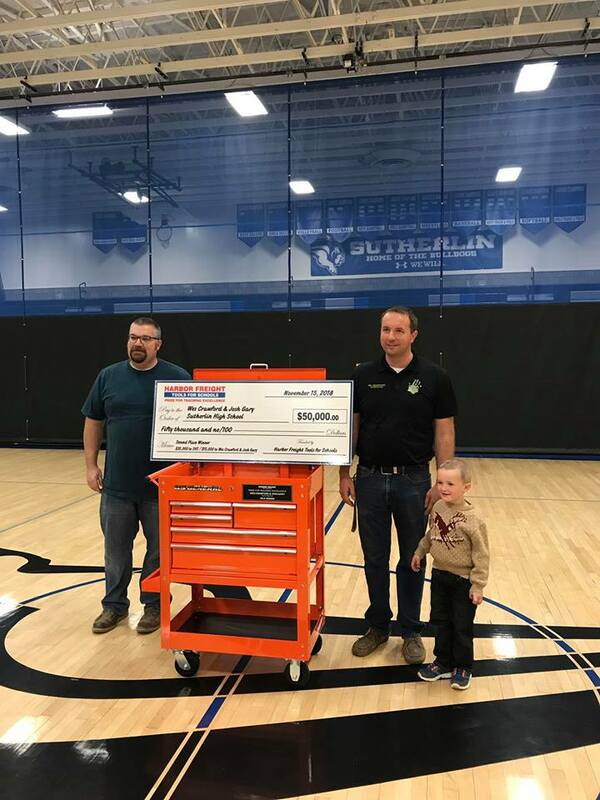 Wes Crawford and Josh Gary, who teach woods manufacturing, welding and agricultural science at Sutherlin High School, were surprised with the news at a schoolwide assembly in November by a representative from Harbor Freight Tools for Schools. Josh Gary (left) and Wes Crawford accept their 2018 Harbor Freight Tools for Schools Prize for Teaching Excellence. Crawford is in his 12th year teaching at Sutherlin High School, and Gary has taught at the high school for 16 years. Crawford teaches welding as an agricultural science and technology teacher and was recognized in 2018 as the national agriculture teacher of the year. Gary leads the school’s woods manufacturing coursework and has experience in cabinet-making, lathe turning and home remodeling. The pair were also semifinalists for the 2017 Harbor Freight Tools for Schools Prize for Teaching Excellence. When Crawford and Gary began teaching, the high school lacked modern welders, technology access, facility infrastructure, relevant equipment and enough tools, creating a roadblock for the teachers to create a curriculum that would prepare students for a career in the trades. In 2013, they won a competitive career and trade education (CTE) grant from the state, enabling them to modernize their programs for 21st century learning. They have continued to utilize student interests to drive much of their teaching—personalizing learning and integrating universal skills seamlessly to engage students and support their success in high school and beyond. Crawford and Gary have recruited 17 local industry partners from global manufacturers to offer continuing advice on equipment and software selection, teaching strategies and projects. This network also provides their students with important industry relationships, factory tours and candid career advice. The teachers have also created industry partnerships to give their students access to a local saw mill where they can create their own projects. And each summer, the teachers offer a summer shop management seminar for woods and welding teachers. To date, 100 teachers have participated. Douglas County Partners for Student Success is excited to see industry and education connecting in such a strong partnership. Crawford and Gary are two shining examples of the work being done throughout Douglas County to ensure our youth are aware of the many opportunities that exist locally as we strive to “grow our own” workforce.